Cat parents unanimously agree that while cats are great companions and fun to be around, no one wants a stinky litter box in their home. Consequently, litter box odor control is key. The right litter for your cat is one that effectively absorbs urine, neutralizes odors and is convenient to change. However, with so many options and varieties of litter, it is important to understand the ingredients of each litter. There are a plethora of choices -- clumping litters made from clay, non-clumping clay litters, recycled paper, and crystal litter made from amorphous silica. When it comes to crystal silica litter, it checks all the boxes on odor control and cleanliness, and because it’s soft to walk on it is suitable for cats of all ages. There is some confusion around crystal silica litter because the mere mention of silica conjures up images of those little packets of crystalline silica found in products ranging from medication to beef jerky, and everything in between. These silica packets are used to keep products fresh and prevent them from getting soft and soggy. However, the silica used in crystal litter is specifically formulated for cat litter and is made from amorphous silica gel, not crystalline silica gel. Amorphous silica is a mined material and is found most commonly in the form of quartz crystal. 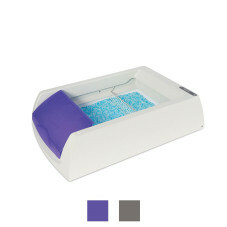 ScoopFree® Crystal Litter Trays are disposable and come with trays for easy cleanup. Crystal silica gel litter is designed to be disposed of in the trash as a sealed unit; they are not designed to be flushed down a toilet. How does it control odor? Crystal litter absorbs urine and dehydrates waste, making it five times more effective at reducing odors than other litters such as clumping clay. It is also more cost-effective as cats use less crystal litter over time. Crystal litter is used in automatic litter boxes such as the PetSafe® ScoopFree® Self-Cleaning range of litter boxes and non-automatic litter boxes such as the PetSafe® Deluxe Crystal Littler Box System. 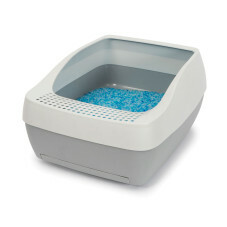 Unique ScoopFree® Premium Crystal Litter is manufactured for these crystal litter boxes. A single tray can last a month in a single cat household and two weeks in a two-cat household. Further, in the automatized boxes, the solid waste is raked into a covered trap, so you never have to touch or see smelly waste. Another plus is that crystal silica litter is 99.9 percent dust-free and ideal to use in households where both pets and people have health issues and shouldn’t be exposed to dust in the air. I thought lavender was harmful to cats, why is there lavender scented litter? 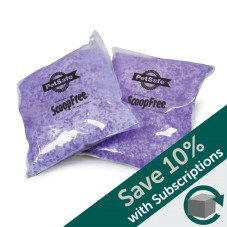 ScoopFree® Premium Crystal Litter is available in unscented, sensitive, and lavender. Because the light lavender fragrance is a synthetic one, it is soothing to cats, unlike essential oils which their systems can’t metabolize. Both the unscented and scented versions of the Premium Crystal Litter will help keep your home smelling fresh. However, if you or your cat are sensitive to fragrances go for the ScoopFree® Premium Sensitive Crystal Litter, free of perfume and dyes while maintaining the same odor control. What should I do if my dog goes near the litter box? There are other salient questions being asked by pet parents about crystal litter namely is silica gel litter toxic to dogs? Amorphous silica gel is not classified as a carcinogen to humans or pets and is non-toxic if ingested. If your cat or dog snacks on a couple of crystals or small bites of litter, they should be perfectly fine. Just be sure he drinks plenty of water to help pass the crystals through his system. However, you should make sure your pets, including dogs, don’t eat a large amount of litter of any kind. If you are worried about curious canines here are a few tips to keep him out of the litter box. Use a hood with the litter box. The ScoopFree® Ultra versions are available with standard hoods and top-entry hoods, for added privacy. If you are using an Ultra version of the ScoopFree® you can also set the timer to sweep 5 minutes after your cat uses the box. Place the litter box where you dog cannot reach it, such as in a closet or on a raised shelf. Put the litter box in a room where your dog doesn’t have access and use a PetSafe® Pet Door, so only your cat can enter the room. Use a PetSafe® Pawz Away® Pet Barrier to keep your dog away from the litter box area. We recommend contacting your vet if you have medical any questions.